The easiest way to make pizza for 1-2 people? Flatbreads! 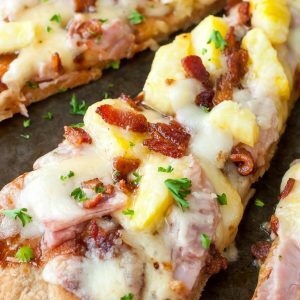 These BBQ Hawaiian Flatbread Pizzas are quick, easy, and totally delicious! Today we’re talking about pizza, folks. Is that not the best kind? I think so! 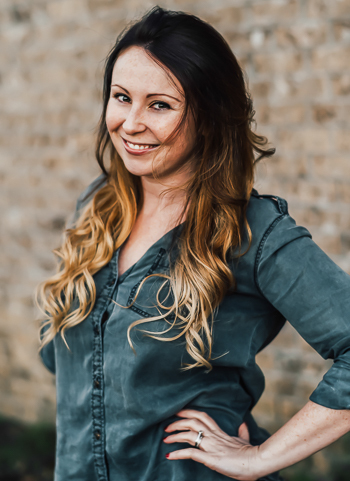 If you’ve poked around this little blog of mine before, you’ve probably noticed that I have a wee bit of an obsession with all things easy and cheesy. I also LOVE taking something as simple as naan or pita bread and turning it into a personal pizza. When I’m all out of bell peppers for my infamous BP Pizzas this is totally my next course of action. Let’s skip delivery, ditch the frozen pie, and grab some fluffy flatbread… it’s pizza time! This tasty recipe features fluffy naan (or pita bread!) topped with tangy barbecue sauce, melted cheese, juicy pineapple, with a little thin-sliced ham and crispy bacon for good measure. De. Lish. 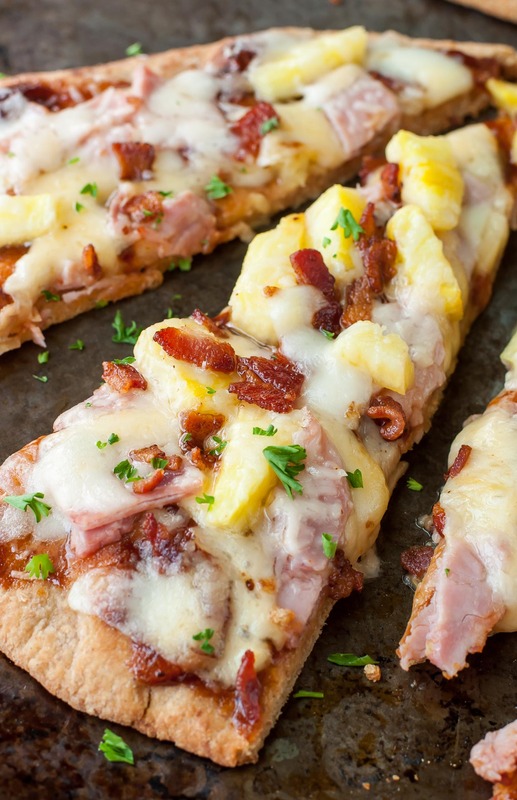 These BBQ Hawaiian Flatbread Pizzas are quick, easy, and totally delicious! Pre-heat oven to 350 degree F.
Spritz naan with olive oil and bake on a baking sheet for 5-8 min until edges are golden. For extra-crispy crust place flatbread directly on rack. Top pizza with a mountain of the above toppings, sauce first, and bake on a baking sheet for 8-12 minutes or until hot and melty. Sprinkle some fresh parsley on top for a burst of color and dig in! I was out of spinach when I made these but OHMYGOSH if you have fresh spinach, add it! I'll give you 5000 bonus points and a gold star for adding a veggie to this tasty little pizza! Sautéed onion would also make a fantastic addition! See post below for swaps + special diets. vegansaurus + brontosaurus chefs: You can 110% take the BBQ pineapple theme of this pizza and run with it! Use your favorite smoky sweet barbecue sauce as the base and pile this pizza high with fresh juicy pineapple and grilled peppers, onions, + even portobello mushrooms. Have fun with it! gluten-free chefs: Swap the naan flatbread for your favorite GF crust! Use anything from a crispy homemade zucchini or cauliflower crust to pre-packaged gluten-free crusts. You can also try serving it on a bell pepper or sliced zucchini for a gluten-free pizza thats equal parts easy and delicious. so . . . how was it?! My t-rex of a husband pretty much adored me for this one! I made both my Hawaiian Bell Pepper Pizzas and these tasty BBQ Hawaiian Flatbread Pizzas in the same day and the amount of food this man put down was ridiculous! I expected to have lots of leftovers but, between the two of us, both recipes were gone in a day! I almost managed to score next-day leftovers, but when the pilot strolled back in at midnight he scarfed the remaining pizza and left me with crumbs. Luckily both are so stinkin’ quick and easy to make they can make repeat appearances with next to no effort. Score! As for moi, I basically never want to have Hawaiian pizza without some sort of smoky-sweet barbecue sauce situation involved ever again. Holy deliciousness, batman! The pairing is just so super tasty together, you guys have got to try it! Buffalo Chicken Taco Salad <— OMG! I’m on the same wavelength – love Hawaiian pizza and def wouldn’t skip the BBQ sauce! I love that you put it on naan flatbread. What a great change up! And I’ve never tried mine with havaarti cheese but it sounds awesome! Thanks Linda! Hope you get a chance to try it soon! I love how delicious and how easy this recipe looks. I am going to try to cook it tomorrow. This looks so yummy! 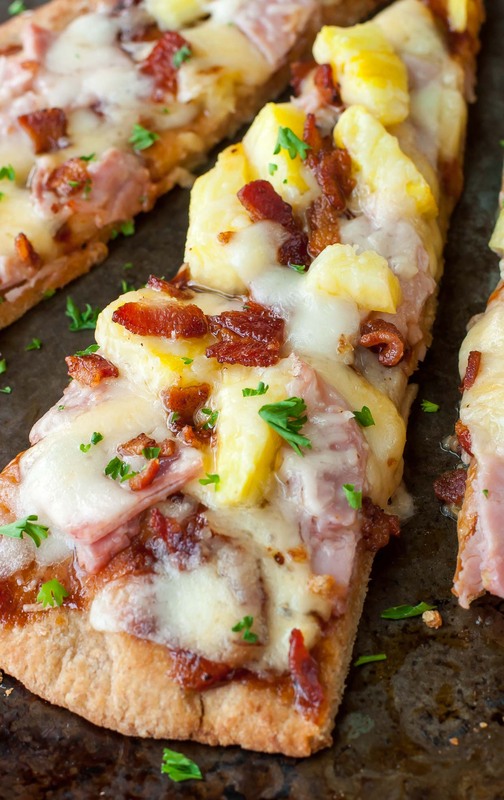 I love Hawaiian Pizza and this is so easy! Thanks for all the low carb and other swaps too! Looks so yummy! I love the addition of pineapple in there, that’s my go-to choice for pizza. And that chopped crispy bacon is killing me. I need some. Rachel @ Mesa Cooking Co.
Wow, love this! How simple – just grab some flatbread! Love the BBQ Hawaiian too – those flavors are just to die for!